Since Cai Lun greatly improved paper production during the Eastern Han Dynasty, 25-220 AD, by using cheaper materials and making it more accessible to the common people, zhezhi, or paper folding, and Jianzhi, paper cutting, have had important ceremonial and decorative roles in Chinese society and culture. Within the past 10-15 years computers, smartphones, and computer games have taken captive the imaginations and ‘in between time’ time of Chinese people replacing the more common and manual forms of ceremony and design with virtual and digital entertainment. 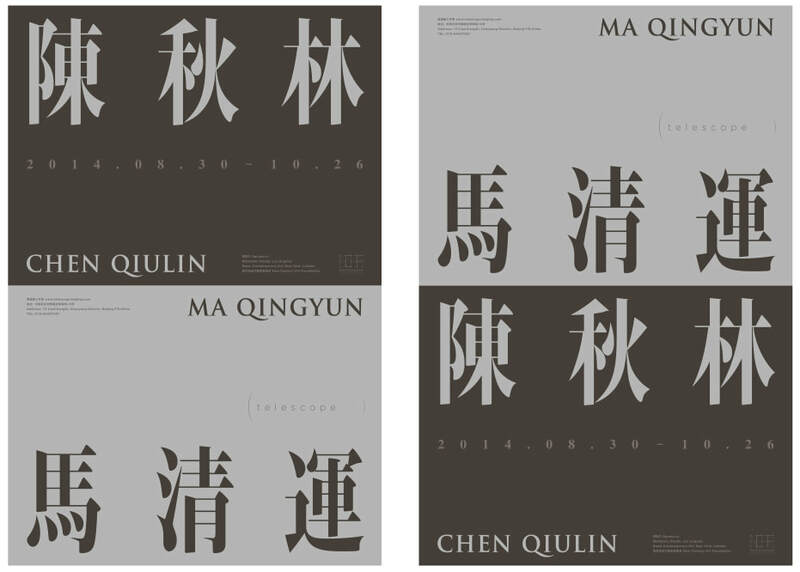 Chen Qiulin’s work for the past 10 years has been about memory and loss and the impact upon society of China’s political and economic reforms. From watching her hometown being dismantled and submerged in the waters of the Three Gorges Dam, to the devastation of the 2008 Sichuan earthquake, she has experienced the reverberations of loss and has been telling this story through her and others personal experiences in various ways and mediums. Chen’s newest installation work, 14,235, was produced in Jingdezhen, where the finest porcelain in the world has been produced for over 1,700 years. It is made up of 14,235 white porcelain zhezhi objects. 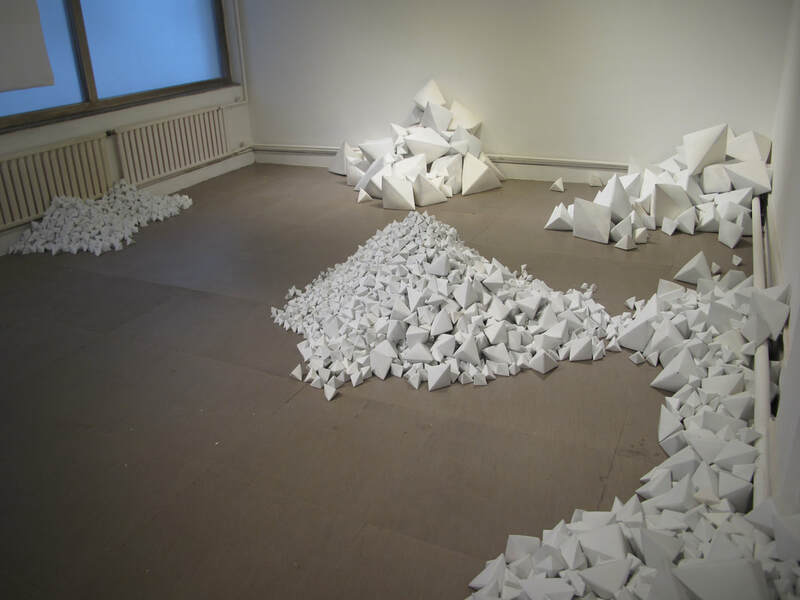 Chen’s initial installation is composed of several hundred zhezhi of varying sizes that are in heaps on the floor of the main gallery space. 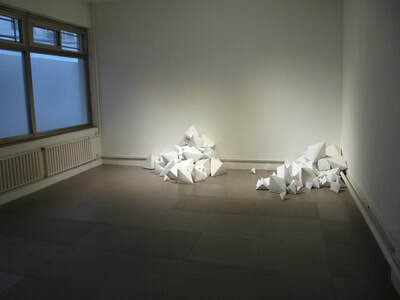 Over the course of the show, more and more pieces will arrive and be added to the installation. Like a sea of geometric salt crystal formations they will seem to grow out into the space until 1000’s of white porcelain zhezhi fill the gallery. 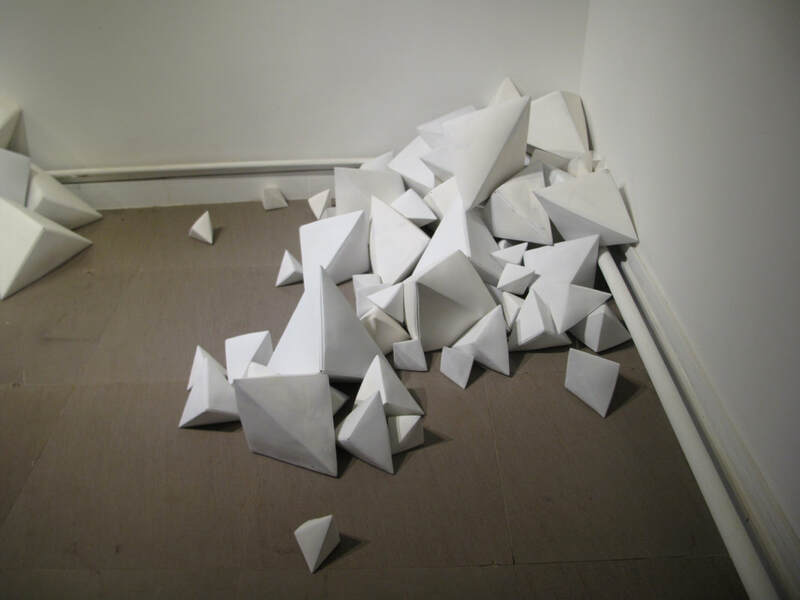 When I first came to China in 2008 I noticed folded paper objects all the time on the streets and sidewalks, around bus stops, plazas, anywhere people walked, congregated, sat, or talked. I watched children play games throwing tightly folded zhezhi squares to the ground trying to flip their opponent’s pieces into the air. 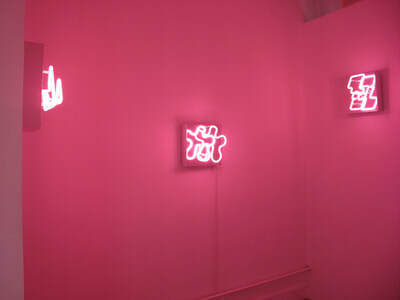 These objects and practice come from a Chinese folk tradition with direct links to the ancient past. 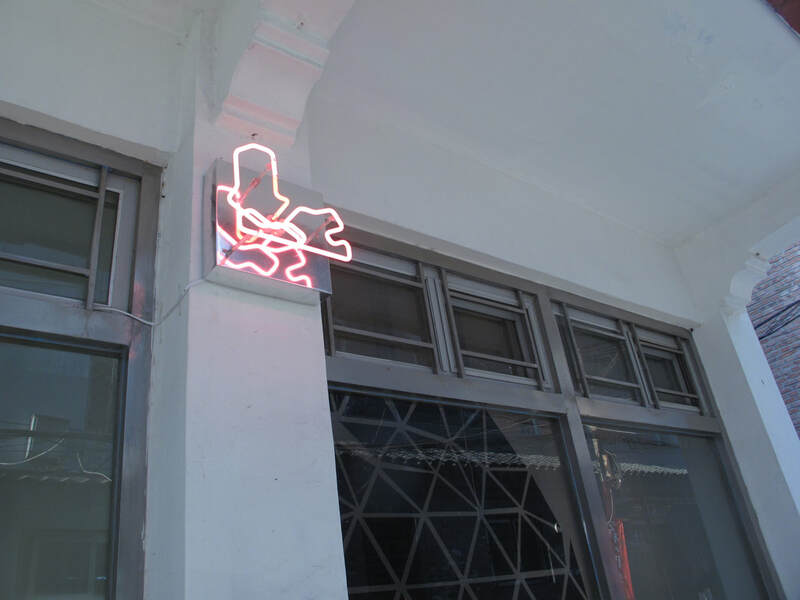 In the last couple of years I have found less and less zhezhi, at least in Beijing, and now daily watch people gazing into their smartphones playing computer games and watching movies isolated from their friends and the world around them. 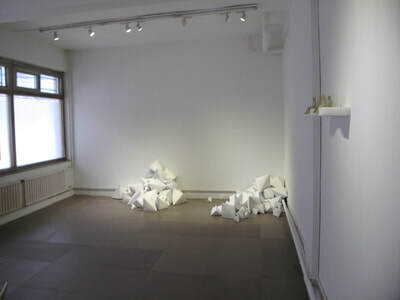 Chen’s traditional materials and methods might lead one to misinterpret her narrative as simply abstract or decorative. 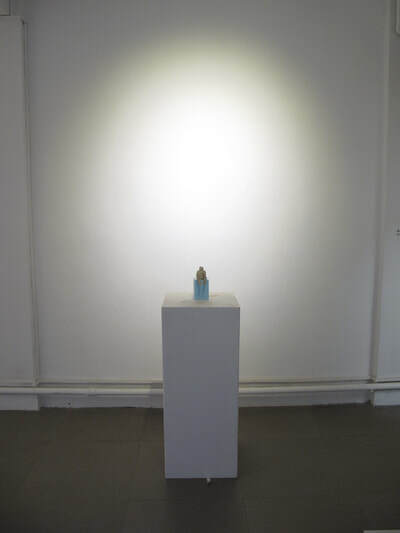 But if you observe Chen’s earlier works, and make a connection to her themes of displacement and loss in rural China, these porcelain zhezhi could easily remind us of the 1000’s of forgotten who are pushed aside in the name of “progress” and the good of society. Or they could just be the shards of personal memory housed in disposable paper containers and lost in the heap of time and uniformity. Her work views two distinct worlds that are growing dangerously apart. These humble forms huddled together on the floor like new fallen snow cover a multitude of wrongs and point the way to a better day; the common and transient now rendered white and pure, forever. Also included in the exhibition are small figures made of ‘papier mache.’ They are insignificant in stature but powerful in scope. 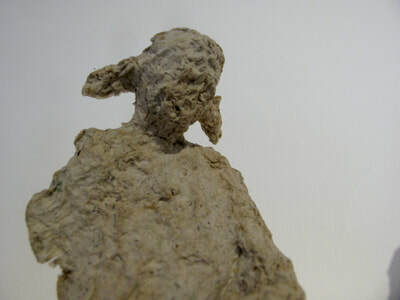 Terrifying, humorous, breathtaking, they are amazing portraits of the soul and body of mankind. 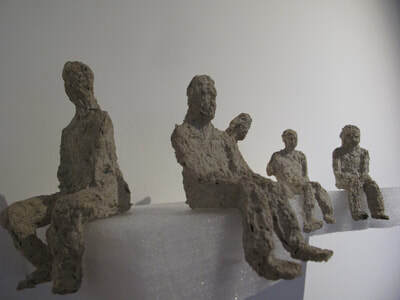 Ancient and disfigured they sit with feet dangling in the air peering out over the white geometric field pondering their plight and history, as people in Chen’s hometown did as they sat and watched their homes being dismantled then drowned in water, or crushed by natural disasters. Their dried and broken bodies are in a frozen state of decay but their spirits, like children, are resilient and ever young. 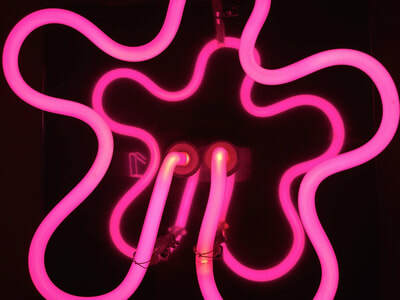 Ma Qingyun, considered to be one of the most influential designers and architects in the world, presents new sculptures of pink neon entitled Lite-urbanism. 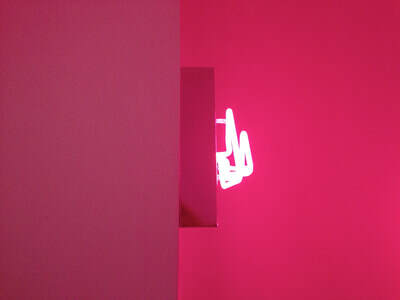 Ma suggests a new urbanism by reducing form and function to simple calligraphic lines in the fragile light of neon. 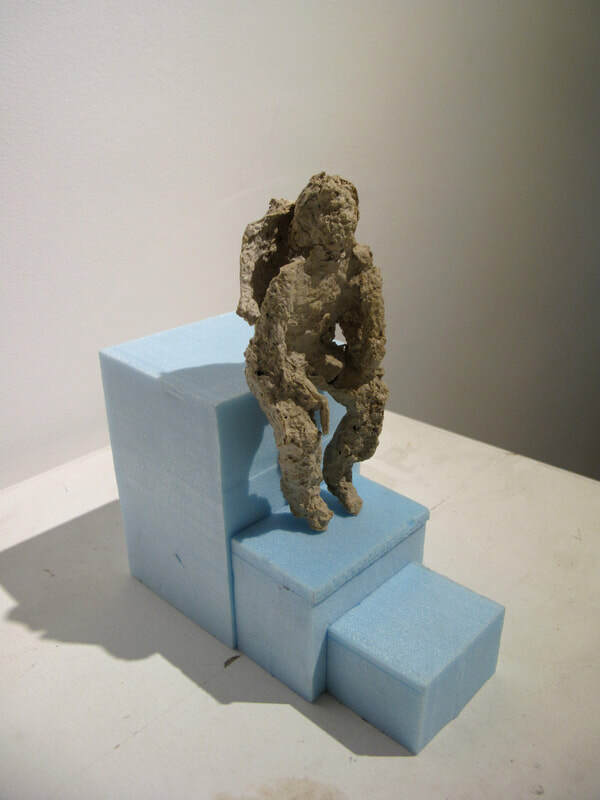 These works, “whimsical” yet “alien,” are based on Ma’s un-built architectural projects. Perhaps it is fitting that this work is based on ideas for buildings and not the buildings themselves, as impermanence is extremely important in Ma’s philosophy and in Chinese culture in general. Ma states that Confucius basically said, “It’s gone. It’s gone,” that all in life is impermanent and that life itself is a flow, in flux, you cannot hold onto anything. Architecture is based on strength and long-term stability, but in Eastern thought it is understood that ‘everything’ changes. The west is obsessed with preservation of all they have built, while the east allows for decay and ultimately replacement. Ma asks the question, should we consider “temporary buildings instead of eternal monuments?” For Ma, to move from massive city planning and large scale building projects to a small non profit art space in an old massage parlor in Cao Chang Di, and from powerful architectural materials to fragile tubes of glass filled with pink ether is a testament to his basic creative philosophy. Ma states, “In the end, for me, architecture is not about buildings, it is actually about creating everything, that environment can be anything or everything; a conversation even,” or an ephemeral line of glass in space. 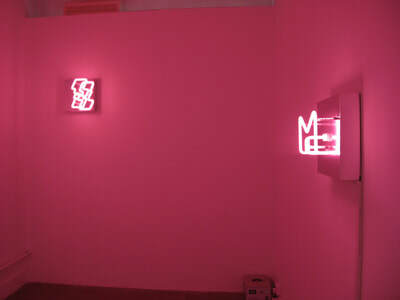 In Telescope Ma has installed several one-foot square aluminum box neon signs. 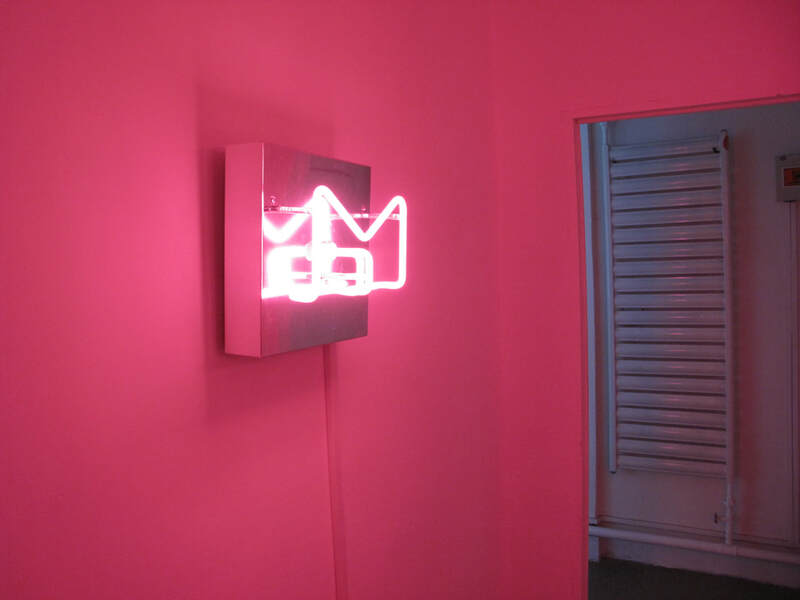 They are small in scale, the lights are fragile and thin, but their hot pink glow dominates the room from floor to ceiling and fills the air. They are abstract, adaptable, and have the power of “swiftness” states Ma. 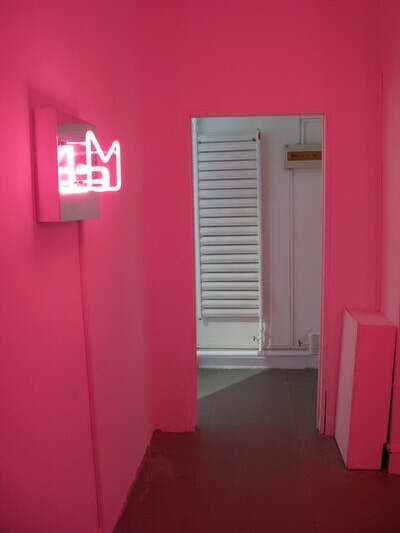 Stepping into the room it is easy to lose your breath and sense of place and time as you are suddenly enveloped in pink light. The sensation is profound, mysterious, and indescribable. It has the strange allure of a siren, a beauty that is irresistible, but alien and possibly dangerous. This is a new place where identities are challenged and boundaries and traditions are broken. A place where you don’t know what comes next? Lite urbanism represents a new city, one that can be turned on and off as needed, adapts swiftly to the changing needs and desires of the city. It is a new non-substantial, non-obstructive, yet pervasive city. Lite Urbanism at Telescope is just the beginning to Ma’s vision of the future, to make an entire city of these lights. “A city of never built projects, a space of ever flowing energy, whenever, wherever and however, “ proclaims Ma. Lite urbanism sprawl is headed your way.